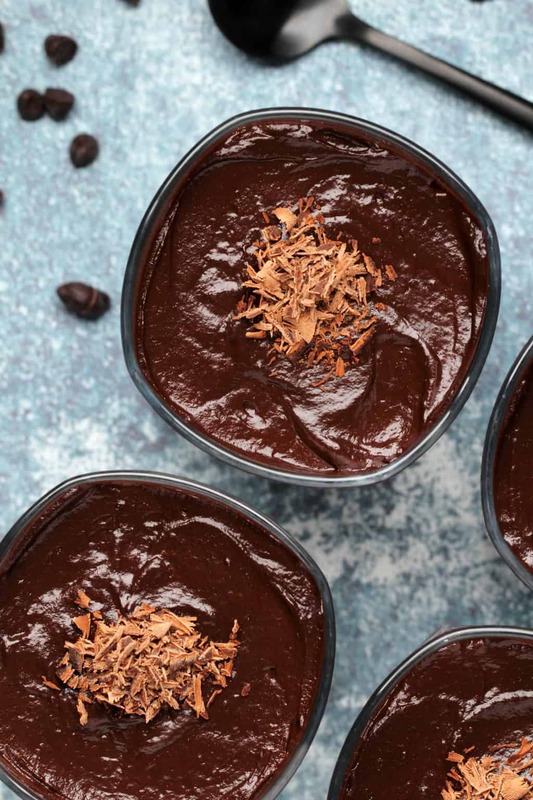 Smooth and creamy vegan chocolate avocado mousse. 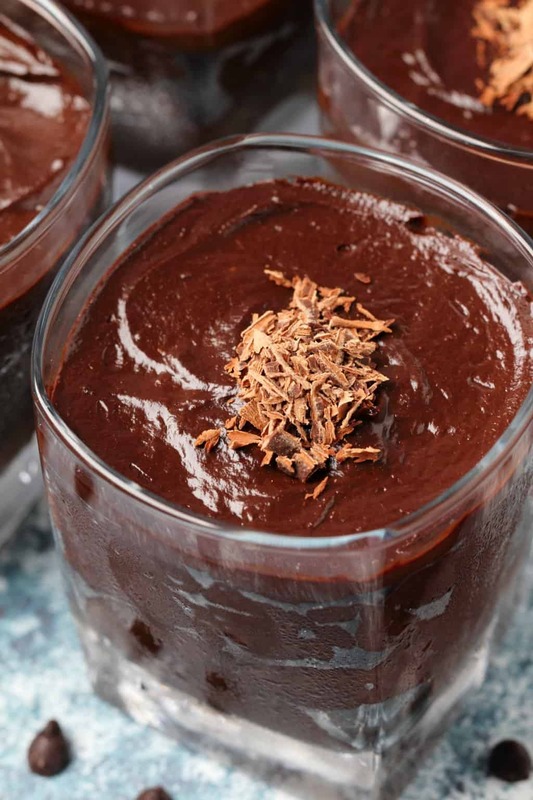 You’d never guess from the taste that the main ingredient is avocado in this perfectly textured mousse! 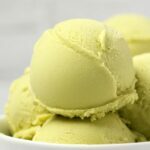 Avocado as an ingredient in a dessert? I’ll admit this was something I found it hard to get my head around. That is until a few years ago when I made a chocolate pie using avocado as the main ingredient and just about blew my own mind. It works for savory things and sweet things. It works for all the things. Avocados are basically magic is what I’m saying. 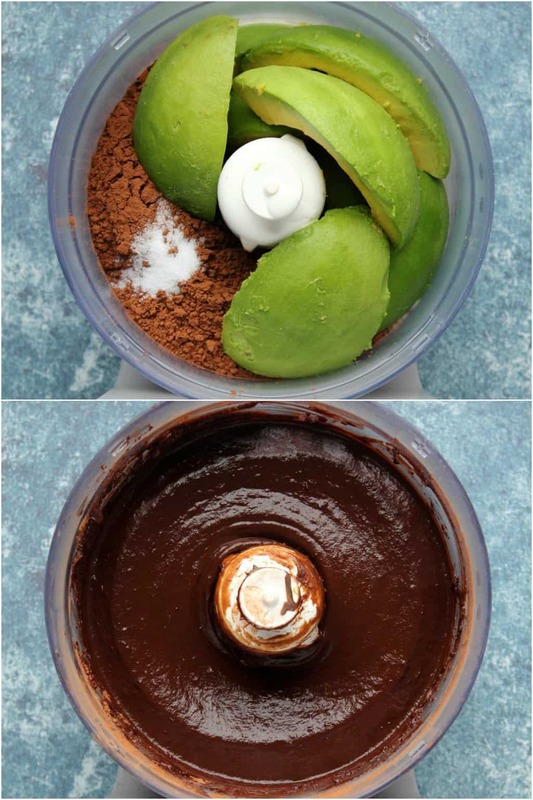 When combined with some cocoa powder and melted vegan chocolate and a few other things you’ll never guess there’s avocado in there at all. 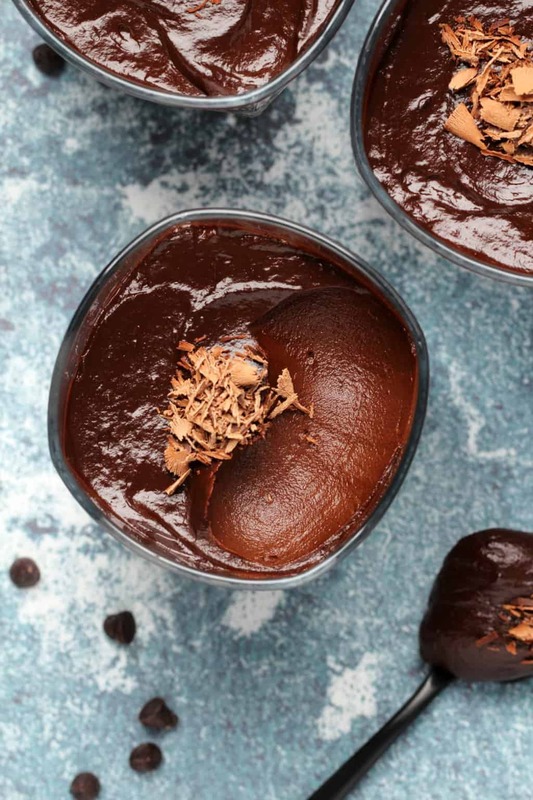 What you have instead is the most perfectly smooth wonderfully textured chocolate mousse of your dreams. Like I said, basically magic. This dessert is so easy to make! It’s only 7 easy ingredients and you pretty much just add them all to a food processor and process until gloriously smooth. 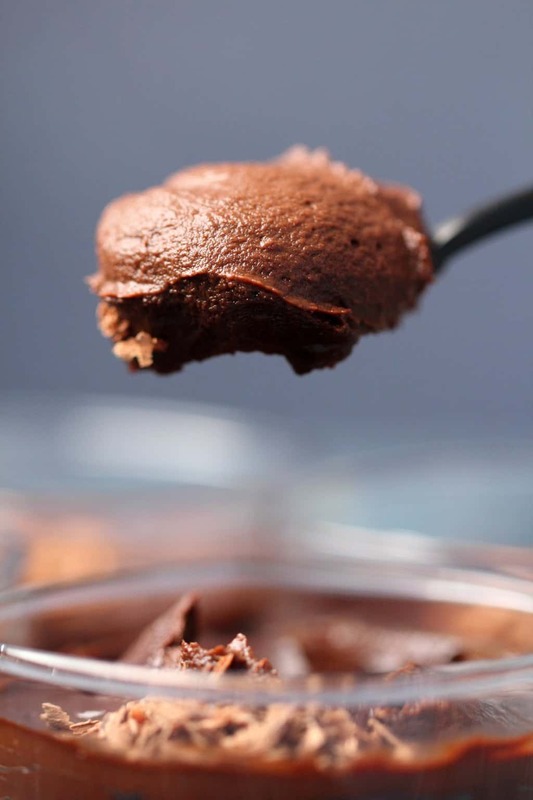 The main ingredient is of course fresh ripe avocado and then we have cocoa powder, some melted vegan chocolate or chocolate chips, maple syrup, vanilla, coconut cream and salt (full details are in the recipe card at the bottom of the post). The only thing to watch out for is that the avocado is properly blended in with the rest of the ingredients. Sometimes when you think you’re done and you’re scooping it out into the serving glasses you’ll find some chunks of avocado that didn’t get blended in properly. So make sure it’s all nicely blended in. The avocados must be perfectly ripe for the best results in this recipe. 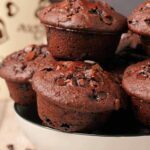 Use unsweetened cocoa powder and a good tasting vegan chocolate or chocolate chips for melting. We used maple syrup for this but you could switch that out for any kind of syrup if maple syrup is hard to find. We used canned coconut cream, but if you have an issue with coconut, you can use a different vegan cream or even a non-dairy milk. The end result tastes nothing like coconut (or avocado for that matter), it just tastes like chocolate. So even if you’re not a coconut fan, if you don’t actually have an allergy I would still go ahead and use it because you won’t taste it in the end result. Store leftovers in the refrigerator (covered) and enjoy within a few days and up to a maximum of 1 week. 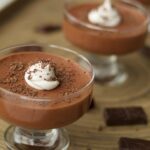 If you love a good chocolate mousse then we have some other great options for you. 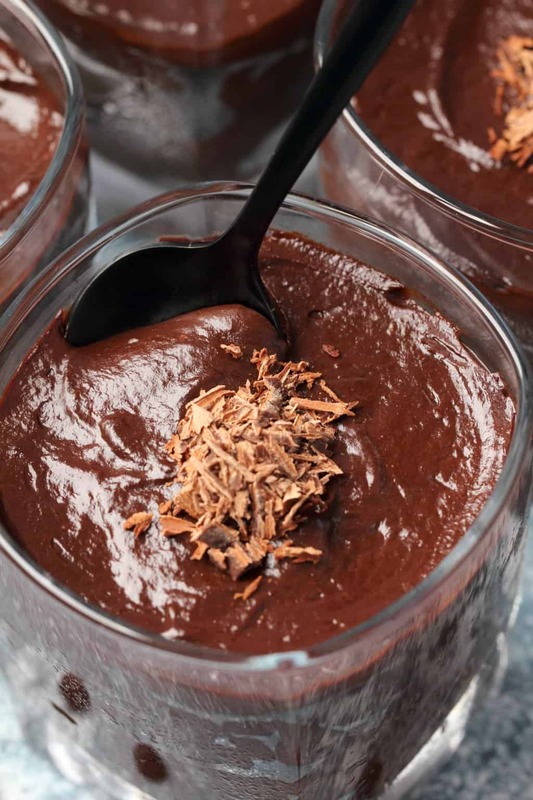 Our vegan chocolate mousse is made with dates and coconut cream for a seriously amazing chocolate mousse texture. Our vegan peppermint chocolate mousse is made with aquafaba and melted vegan chocolate for a very surprising (divine) result! And then our vegan chocolate ice cream is so damn chocolatey it sort of reminds you of mousse! 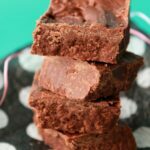 Other highly noteworthy chocolate desserts are our vegan chocolate brownies, our best vegan chocolate cake, our classic vegan chocolate cupcakes and our vegan chocolate truffles. 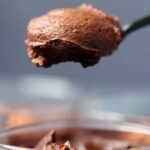 So let us know what you think of this vegan chocolate avocado mousse in the comments and please rate the recipe too, thanks! Sign up to our email list before you go, we’ll send you a gorgeous recipe ebook containing 10 delicious vegan dinner recipes and you’ll be the first to know when new recipes are posted to the blog. Add the maple syrup, coconut cream, melted vegan chocolate chips, cocoa powder, vanilla and salt to the food processor. Then add in the avocado flesh and process until very smooth. Make sure the avocado is properly blended in. 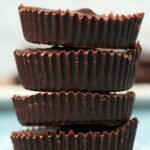 Transfer to 4 serving glasses, top with grated vegan chocolate (optional) and refrigerate for 1-2 hours before serving. *You can also just use any vegan chocolate that you like, it doesn’t have to be chocolate chips, just measure it first before melting as that’s the easiest way to do it. Looks amazing! Does the coconut cream need to be chilled first? Yay!!!! I’m going to make this today then! Thanks! This. Is. Fabulous. 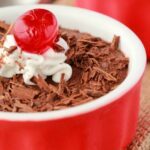 So glad to have a rich & creamy recipe for a mousse option. I’ve used avocado for a choc ice cream in my Vitamix and it comes out so smooth. Thank you! Can’t stop making this, its so delicious!!! !